Set right on the shore of the enchanting Lake Garda, Vallicella provides guests with a huge range of amenities to make use of. Let LuxCamp take care of the booking to make sure that all details are covered. Lake Garda is backed by rolling hills and a number of pretty hiking trails run through them. 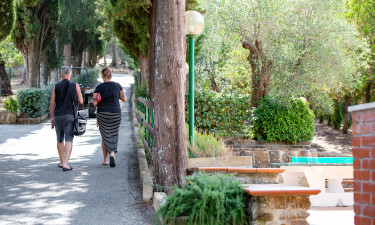 Guests will also find the charming villages and towns of Tuscany right on their doorstep. Lake Garda is fringed by a strip of golden sand and guests will be able to walk down to the beach in just a couple of minutes from their mobile home. Taking a boat trip on the lake is a great way to get a feel for the beauty of the area, while the water is also smooth enough for children to swim safely. 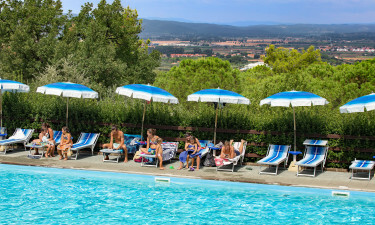 Luxury camping lovers will have plenty of other chances to swim as a large outdoor swimming pool can be found in the heart of the site and features an attached wading pool. The surrounding patio area is set with sun loungers and guests can gaze out at the lovely lake while catching the sun."